We're delighted to share with you all the New York based Yoga non-profit ,Souljourn Yoga and inspiring women's travel company, Willow&Blair have chosen us as their partner non-profit for their first journey into inspiring India! Next New Year's they will be bringing to India a group of likeminded travellers to do yoga, explore the country's colourful culture and visit our projects in Tamil Nadu! These generous travellers include a donation to our work in their costs, which will support our work with some of the elder girls from the Londor community. Specifically, the tours donation will help us launch a new project with secondary school aged girls that will run at weekends outside of school time. The idea for this project came as a response to concerns raised by many parents about the pressure of child marriage for their daughters once they reach puberty. The projects aim will be to educate and inspire girls on topics they wouldn't learn inside the classroom. We wish to tackle some of the repeated problems we see regularly affecting girls we work with; child marriage, teenage dropouts, teenage pregnancy, lack of ambition, low self-esteem and self worth. We believe that all the girls we work with can do whatever they put their mind to in life, but they are too often limited by the barriers that society, their families and even the education system places in front of Indian girls. If you're reading this and thinking... "Daily yoga? Travelling with a supportive group of women? The chance to explore beautiful Southern India? This sounds dreamy!" then read on! You can now also book you spot on the tour which lands in India for 10 days on December 28th 2018. More details of the trip and itinerary below. Meet and assist on arrival into Kerala, private transfer from Trivandrum International Airport (TRV) will be provided. Get settled, unwind, and relaxed. We will meet for an opening ceremony and evening yoga practice before dinner and a good night’s sleep as we begin our amazing journey together. Sail around the beautiful Kerala backwaters in a traditional Keralan houseboat. Enjoy lunch on the boat. Float by rice paddies, temples, exotic flowers, banana’s and coconut groves. Then spend the evening in the colonial majesty of Kochi where we’ll dine out together. After morning practice we’ll travel the short distance back to Kochi and you can spend your time wandering the alleys and lanes of the fort town. Visit one of the many architecturally inspiring churches, temples or art galleries. Or just sit with a tea and watch the world go by. An opportunity to visit a local charity working with street animals is available also. We’ll share together in an evening Satsang (spiritual study) and Kirtan (chanting). Today is for relaxation and self care. Start your day with a practice together then spend your time at the spa receiving a traditional Ayurveda massage, take a walk, or a swim in the hotel pool. We’ll share together a special NYE’s meditation and intention setting as we bring in 2019 together. After early morning yoga we’ll begin our travel to Tamil Nadu. This is a long journey in which we will have multiple stops for food, restroom breaks and for photo opportunities. The ride will afford a real glimpse into South Indian life and you will have the opportunity to experience the full breadth of the diverse South Indian landscape. Think tea and spice plantations, waterfalls, British hill stations and quaint hillside villages. We’ll have motivational discussions along the way to help pass the time and perhaps even a half way meditation to restore our tired eyes. Stretch your well travelled bones with morning yoga or a dip in the pool. In the morning we’ll go on a sightseeing tour of the ancient temples in Thanjavur. After lunch we’ll depart the hotel for our final stop in Pondicherry. Dinner is at your leisure, with an optional yoga and meditation class in the evening. Early morning yoga practice followed by a scrumptious breakfast before we get discovering Pondicherry, which is a French colonial settlement clad with tree lined streets, vibrant colonial villas, and stylish boutiques. The group will take a walking tour of this historic town and then will have the afternoon to explore. Evening yoga and dinner will follow. After breakfast we’ll head to My Name is Kumar Foundation for a look into some of the work your donation is supporting. We’ll enjoy jewelry making, henna design and a dance workshop with the children. We’ll share a tasty banana leaf lunch and the girls will teach you how to eat with your hand, the Indian way! We’ll finish the day with a talent show and celebration all together. Get a taste of utopia with today’s visit to Auroville, the unique community granted special permission by the Indian government and home to more than 3,000 people. We’ll tour around this ideal of communal living with some of the secondary school aged girls from the My Name is Kumar project and look upon the magnificent Matrimandir – a giant golden globe built in the 1970s as a space for meditation and contemplation. On our last evening together we’ll have a dinner with the girls and say our goodbyes. Our last day together on the tour. Take some time for yourself; receive a massage, go gift buying, or visit one of Pondicherry’s bakeries or ashrams. We’ll end our amazing adventure together with yoga, meditation and a closing circle. 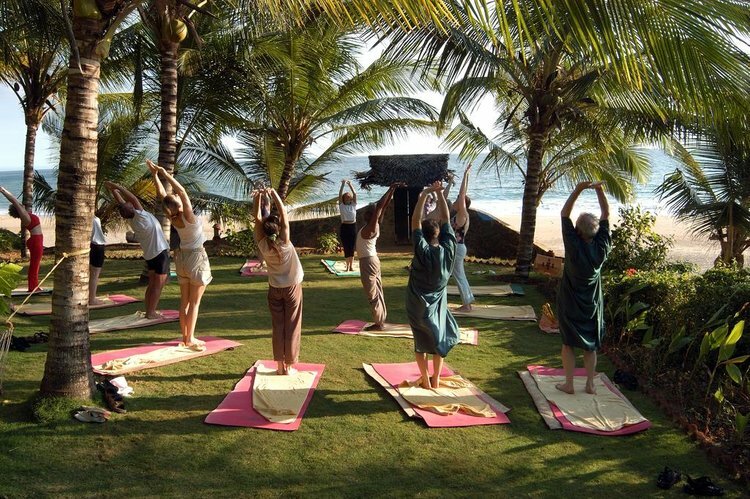 Wake for sunrise yoga and meditation or sleep in for your last morning in India. Transfer to Chennai International Airport.